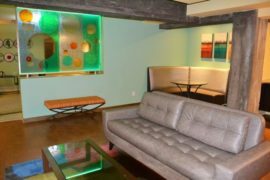 Before, the lobby and hallway areas in The Calhoun Apartments in the Uptown area of Minneapolis were feeling a bit dated and unenticing. Some things needed to be updated, with a new color palette and décor. The Uptown area is lively and vibrant, and the space needed to match that to appeal to renters and stay competitive with other newer buildings in the area. We took a creative approach with color and materials, to bring the energy up and make the space feel funky and playful. Since it’s right on Lake Calhoun, we integrated a lakeside ambiance. We’d made some updates to The Calhoun in the past, including redesigning the party room and obtaining artwork for the lobby and hallways. This time, we kept the existing artwork, and enhanced the space with complementary paint, wallcoverings, and carpet tiles with interesting patterns. We varied the wallcoverings in the elevator lobbies, for different looks on different floors. The hallways were dark, so we added some canned lights for a brighter, happier space. Around the doors we accented with gray paint and added columns wrapped in an architectural finish material that resembles exotic wood, to create a unique look and set off the doors. In the lobby, the banquet was taken out, and more sleek furniture was added to make it more open and airy. The result feels fresh and welcoming. Julie Ann is wonderful to work with; she always has several options, and it’s a nice process. She’d helped us with The Calhoun, a 1959 mid-rise apartment building before, with artwork and other upgrades, but with lots of new buildings in the area we wanted to make sure it fit in and stayed just as hip and trendy. Julie Ann did a great job helping us give it a fresh look with some of that “Uptown Flair.” With new paint, wallcoverings, and other features it just feels better. You don’t walk in thinking “something needs a change.” It feels nice and new. There’s color and pattern; we added more lighting and unique columns around the doors. I feel more confident in showing the space, now that it’s updated. It’s not awkward at all, and this is good timing to have it all done for leasing. There are lots of choices for rentals in Uptown, but this is one of the few on the lake. It’s just across the street, and apart from the busy areas, so you feel like you can breathe. It’s a great value, and managed by a company that cares, where there’s someone available when you need them.